To continue, use the Sum Rule and Constant Multiple Rule to separate this into four integrals. Don’t forget to distribute that minus sign to all four integrals! Notice that when you substitute back in terms of x, the power goes next to the cos rather than next to the x, because you’re raising the entire function cos x to a power. 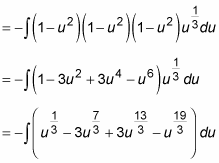 At this point, you can distribute the function and express it as a sum of powers of u.